Ohrid prides itself on many churches whose architecture is outstanding also each of the churches has a splendid story and history behind that will definitely impress you. One of those is the Church of St. Nicholas Bolnichki which is located niear the Ohrid Port on the well-known Car Samuil Street. The Church bears this name due to the fact that long time ago in this area there was a hospital where many people were coping with disease. What will impress you the most when entering the church is definitely its decoration and the way it was built. The Church is made of broken stones and bricks were not used during its construction. On the west side of the Church there is a beautiful bell which has a rare architectural style which makes it unique in this region. 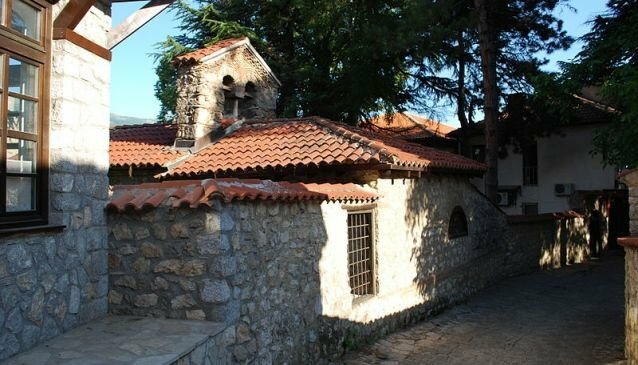 In the spacious courtyard there are pieces of the Samuil Fortress which through the times were rolling to the Ohrid Lake. Colorful paintings and beautiful icons ornament the walls of the Church of St. Nicholas Bolnichki which make it a building that is worth visiting during your stay in Ohrid.